Comet 219463A - Model 20 Series Driven Clutch. Replaces OEM 217776A, MODEL 21D. Measures 6 inch Dia. with 3/4” BORE. Manco, Murray, Salsbury, Stens and Comet clutch systems. Home > COMET INDUSTRIES BELTS > COMET 203588 (A-DF), Comet Industries replacement belt. 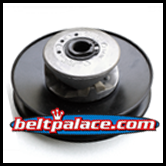 884-130 GoKart Belt. > Comet 219463A Driven Clutch (Assembled). Replaces OEM Model# 21-D. 6” Dia. with 3/4" BORE. REPLACES Previous Comet 217776A clutch. 219463A Comet - Model 20 Series Driven Clutch. Replaces OEM 217776A, MODEL 21D. Measures 6 inch Dia. with 3/4” BORE. 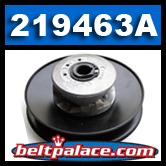 Comet Industries part 219463A replaces worn out or broken Driven clutches on Comet 20 Series systems used on Manco, American Sportworks, Murray, Stens, Kartco, and Salsbury clutch assembly. This fully assembled Driven (axle) or “Lower” Clutch is the Comet replacement part #219463A (previously 217776A ) for Comet/Salsbury clutches on Go Carts, Golf Carts, and Mini-Bikes. Made by Comet Industries. Replaces original Comet 217776A part. Made in USA! NOT AN IMPORTED KNOCK-OFF! Superior replacement for mxtdriven 230982348199.